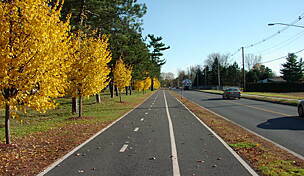 The Island Line Rail Trail offers some of the most spectacular scenery and unique experiences you’ll likely encounter on any bike trail. 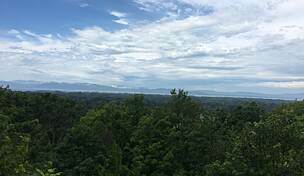 The route follows the Lake Champlain shoreline north from Burlington, Vermont, with beautiful vistas of New York’s Adirondack Mountains off in the distance. 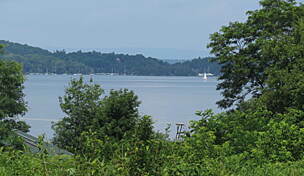 The crown jewel of the trail is a 4-mile causeway which gives the sensation of literally biking over Lake Champlain. The route also travels over the Winooski River Bridge, and includes a ride on a unique bike ferry. With a little something for everyone, this trail offers a lot of variety and is perfect for families. Great trails draw great crowds, however, so set out with the appropriate expectations in order to fully enjoy the experience the Island Line Rail Trail (ILRT) has to offer. Burlington is a gem of a small town. With a thriving arts and music scene, a bustling pedestrian marketplace, innovative dining options, and numerous opportunities for outdoor exploration, visitors are not likely to lack for something interesting to do. The town’s location on beautiful Lake Champlain provides the perfect backdrop for a small, but surprisingly hip destination. While there are numerous options for lodging in town that will suit any budget, perhaps the place that best exemplifies Burlington’s cosmopolitan vibe is Made INN Vermont. The property is an 1881 Victorian with a modern, eclectic interior located in the Historic Hill District of the city. The house is beautifully renovated, having retained the detailed features of Victorians that are so charming, but with a very modern and stylish interior. Made Inn Vermont displays a rotating selection of work by local artists, common spaces feature such quirky amenities as vintage games and a telescope, and the hosts prepare a delicious gourmet breakfast daily. The B&B offers a cozy and relaxed atmosphere, and is the perfect place to return to at the end of full day of biking and sightseeing. To reach Made Inn Vermont from the airport, we suggest taking a taxi for the short 3-mile ride. Public transportation is available, although not very convenient. Car rentals are also available at the airport, and your hosts can direct you to parking either in the driveway or close by. Burlington is a bike-friendly community and there are several bike shops offering rentals. North Star Sports is centrally-located, close to the inn, and offers hybrid rentals. Cyclists in town between mid-May though mid-October can also rent bicycles on the trail at Local Motion. This non-profit bicycle advocacy group runs a rental shop that offers hybrid and tandem bicycles. The organization has been hugely successful in Burlington in promoting bike culture and was instrumental in developing the popular Winooski Bike Ferry (since replaced with a bridge). They now run the bike ferry at the end of the ILRT to South Hero. Support their cause by renting a bicycle, purchasing a t-shirt or trail souvenir, stop by for maps and advice on other places to bike (or hike), or just pop in for a water bottle refill. The rail corridor that the ILRT follows was created in 1899 by the Rutland-Canadian Railroad to connect the New England coast with the Great Lakes. In addition to laying track, six miles of marble causeways and trestles were built to span Lake Champlain. For over sixty years the railway operated along this route until other means of transportation became more cost effective. As early as the 1960s there was discussion about redeveloping the abandoned rail corridor into a multi-use trail, but not until the early 1980s did the idea fully gain traction. The present day ILRT was completed in several sections and involved a lot of effort and support of the communities along the route. 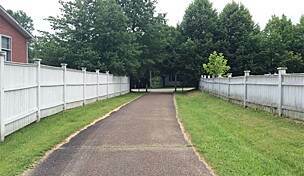 The rail-trail was almost immediately a huge success and is a great example of the effect such a resource can have in both the economic and physical life of a community. The closest trailhead on the Island Line Rail Trail from Made INN Vermont is less than a mile away. After a filling gourmet breakfast at the inn, head south on S. Willard and take the first right on Maple Street following it down towards the waterfront where it will dead-end with the trail. If you are renting bikes at Local Motion, continue north on the trail and you will find the rental shop on your right. From this downtown trailhead, you can head either north or south. The southern section continues for another 2 miles to the southern terminus of the ILRT in Oakledge Park, where there is a parking lot should you decide to begin here. For this itinerary, we recommend heading north. Water refills are available at various points along the route, but as always, we recommend starting out with full water bottles. As noted, this is an incredibly popular rail-trail, and especially in the downtown area, you will encounter a lot of pedestrians in addition to cyclists. Go slow, admire the view, and focus on how wonderful it is that people come out to enjoy this tremendous resource. 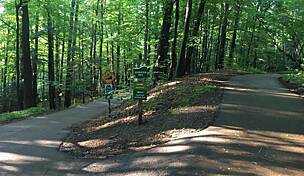 Or, if your schedule allows it, avoid the trail on weekends and mid-day during warm weather. Shortly after setting out look for Union Station on your right. Built in 1916 of brick, granite, and limestone, the building was constructed by the Central Vermont Railway and Rutland Railway. An interesting feature of the building is a set of four steel winged monkey statues that adorn the roof. Two of the four were originally created for a local waterbed factory called Emerald City,and relocated here when the store went out of business. Today, Union Station serves as a rail station only for a tourist route, and is mostly used as a business complex. The monkeys, however, remain and have become a quirky symbol for the city. In this section of the trail you will be biking through Waterfront Park, which includes 900 feet of lakeshore, a boardwalk, boat launches and a festival site which hosts various events during the year. It is worth checking to see if anything is scheduled during your visit as this area is impossible to bike through when an event is going on. There are plenty of other opportunities to join the trail further north, so plan accordingly. Also pass by the Community Sailing Center, a non-profit organization that offers educational and recreational programs for the community. The center also rents dinghies, keelboats, kayaks, canoes, and paddle boards, providing a perfect opportunity to gain another perspective of Lake Champlain and wile away an afternoon. After leaving the downtown area behind, ride through Leddy Park, a large park with parking and restrooms, and a popular departure point for cyclists hoping to avoid the Waterfront Park area. One of the special features of the ILRT is the Winooski River Bridge. This section of the route took over 15 years of planning to make a reality. Local Motion was instrumental in bringing together residents of Burlington and neighboring Colchester County to have the bridge constructed as a critical link connecting the former Burlington Bike Path and the Colchester Causeway. The bridge is structurally quite striking with a 2,500-foot elevated boardwalk that takes bikers and pedestrians over the environmentally sensitive Colchester Delta Park floodplain. The bridge replaces the former bike ferry, which was run by Local Motion. The truly unique feature of the Island Line Rail Trail is the Colchester Causeway. Biking along the marble causeway gives riders the thrilling sensation of truly riding over water. Even the most seasoned biker will enjoy this unusual feature of the trail. Along the way, see American elm lining the path. The trees lean sharply from the harsh lake winds yet have found a refuge here from elm disease that has infected much of their species. As you ride along, look for warblers and kingfishers, common birds for the area. The causeway is abruptly interrupted in Lake Champlain at The Cut,a small gap. Here you can board a bike ferry operated by Local Motion for a short shuttle over the gap to continue on to South Hero.. On South Hero, the trail continues on for another 1.5 miles. Enjoy a leisurely return to Burlington and continue on to the southern terminus in Oakledge Park to gain a full appreciation of the entire 14-mile route. Upon returning to town, if you find it’s difficult to tear yourself away from the striking waterfront view, linger a little longer and enjoy lunch at Shanty on the Shore. Offering some of the best waterfront dining, the seafood restaurant is located trailside in a building dating from the 1830s near Local Motion. For something more casual, stop by Penny Cluse, located just off of Church Street downtown. This small cafe is the perfect place to enjoy a quick, but satisfying and flavor-packed meal. Extremely popular with locals, try such favorite lunch items as chicken and biscuits, sautéed spinach with mushrooms and tomatoes, and mac and cheese. This afternoon spend time meandering down the pedestrian Church Street Marketplace. In addition to being the town’s main shopping area, the street is also the heart of the city and in nice weather is filled with street performers. Various festivals take place here throughout the year as well, including a jazz festival and Festival of Fools, an event that draws street performers from all over the world. On Saturday mornings from May through October, visit the Burlington Farmer’s Market located at City Hall Park and St. Paul Street. At other times of the year, the market moves indoors to the Memorial Auditorium at the corner of Main Street and South Union. The market offers a variety of seasonal produce, flowers, prepared foods, as well as handcrafted goods from local artisans. Tonight enjoy Leunig’s Bistro and Cafe, one of Burlington’s top restaurants and be transported to Paris. Be sure to visit the art-deco inspired lounge on the second floor and enjoy one of their signature cocktails. If Italian sounds more tempting, make a reservation at Trattoria Delia. Located in historical Vermont House, the cozy restaurant’s centerpiece is a large stone fireplace. With a rustic country feel and candle-lit tables, the space exudes a romantic ambiance. The restaurant uses fresh ingredients sourced from local farmers and features dishes representing the flavors of Italy’s various regions. Try the carpaccio, ossobuco, or any number of the delicious fresh pastas. Catch a live performance at The Flynn Center for Performing Arts. The 80-year old theater originally began as a vaudeville house and today provides a magnificent home to the Vermont Symphony Orchestra, the Vermont Youth Orchestra, Lyric Theatre, and Vermont State Company, in addition to hosting many local and touring groups. Cruise Lake Champlain on a classic New England Friendship sloop. For a more leisurely way to enjoy the lake than powering your own vessel, Whistling Man Schooner Company offers three sailings a day aboard a classic schooner, a boat design built in New England for over a hundred years. These elegant ships provide a relaxing way to enjoy the lake and take in the incredible vistas from a slightly different vantage point than the ILRT. Pack a bottle of wine and relax on a sunset cruise for a truly memorable evening. Be sure to reserve a space in advance to get a preferred sailing. Take advantage of the numerous outdoor recreational activities available in Vermont. The Green Mountains provide the perfect backdrop for outdoor exploration and, from Burlington, you do not need to travel far to feel like you’ve gotten away from it all. Stop by the downtown visitor center for information about local hiking, kayaking, zip-lining, tubing, or canoeing opportunities in the region. If you are ready for more biking, nearby St. Albans is the southern terminus for the 26-mile Missisquoi Valley Rail Trail. The trail takes you almost to the Canadian border and offers spectacular farmland scenery and views of the Missisquoi River, with few crowds. Explore cultural sites such as The Shelburne Museum in nearby Shelburne. Considered to be one of the most unconventional art museums in the country, see over 150,000 works exhibited in 38 exhibition buildings, 25 of which are historical and were relocated here from throughout New England and New York. Focusing on Americana, the museum has large collections of folk art, quilts, 19th- and 20th-century decoys, carriages, and much more. In the summer, in conjunction with Ben & Jerry’s, the museum hosts a concert series that attracts top acts in a wide variety of musical genres. On the outskirts of Burlington, also visit the Ethan Allen Homestead, the historical 1787 home of Vermont’s founder Ethan Allen. Exhibits and a guided tour will immerse you in the 18th-century life of this Vermont folk hero.